You’re welcome, Sue. It’s such an energising, health-giving drink. I hope you enjoy it. Not long now till the elderberries are ready! Thanks a million, can’t wait to start making the cordial! Made elderflower cordial in late june, such an enjoyable and rewarding task!! Used good quality bottled water and then used the bottles (50cl) to store and freeze the cordial. I found some excellent tips on the elderflower cordial sites, which as a novice, gave me confidence to get going. All worked out wonderfully! You’re welcome Mary. I agree: elderflowers in the spring do make the most delicious cordial. This one, from the berries, is so different. I think it’s nature’s way of making sure we get a good dose of health-enhancing nutrients through the winter. I always throw a few blackberries into mine too, because you so often find them growing together! Thanks Suzanne. Great recipe and so easy to make. Just made the first batch and I’ve already got everyone wanting to know how i made it! Ryan. So glad you’ve enjoyed making the elderberry cordial, Ryan, and the citrus addition too. I also love adding fresh lemon slices to a jug of elderberry cordial to serve at the table – goes down a treat! Hi – just found this recipe and am delighted to have first go at my elderberries, before the raccoons got them! The majority were ‘very dark’ but a few were red. The bunches were tighter than I thought they would be, however, I picked them. Is there a problem if they are not completely ripe? Just add more sugar? Thanks for the quick response. I look forward to completing the recipe. I couldn’t find my usual recipe and couldn’t quite remember ratios, but yours was just how I have done it in the past – thank you. I also add a cinnamon stick in the simmering stage and I actually left it all in a covered pan overnight, I just felt I would get more out of it that way, it looks and tastes brilliant. Hi Desiree &Suzanne. I add lots of cinnamon & sliced ginger as well as cloves. Makes for a wonderful spiced warm drink in winter . I give bottles to family & friends. My children love it. W are in the north & some of the elderberries are the size of black currants this year. Happy bottling. when are elderberries ready to be picked? Hi Jeanete. Eldeberries are ready to pick right now. In fact, we’re close to the end of the picking season here in Southern England where I live. I picked a batch two days ago and mixed them in a cordial with damsons – lovely! If you live somewhere more northerly, or more exposed, you’ll have a little longer. Can’t believe you didn’t use any spices! It’s best to add something like cloves or cinnamon when adding the sugar – spices it up! Have made it for years! Yes, Judith, there are many variations to this recipe. You can certainly add spices and it’s a nice thing to do especially for winter drinking. I wrote the recipe without because this is the way I prefer it, letting the taste of the elderberries themselves shine through. Hi Suzanna ,I made my first batch of elderberry cordial,that turned out lively.Thank you very much. 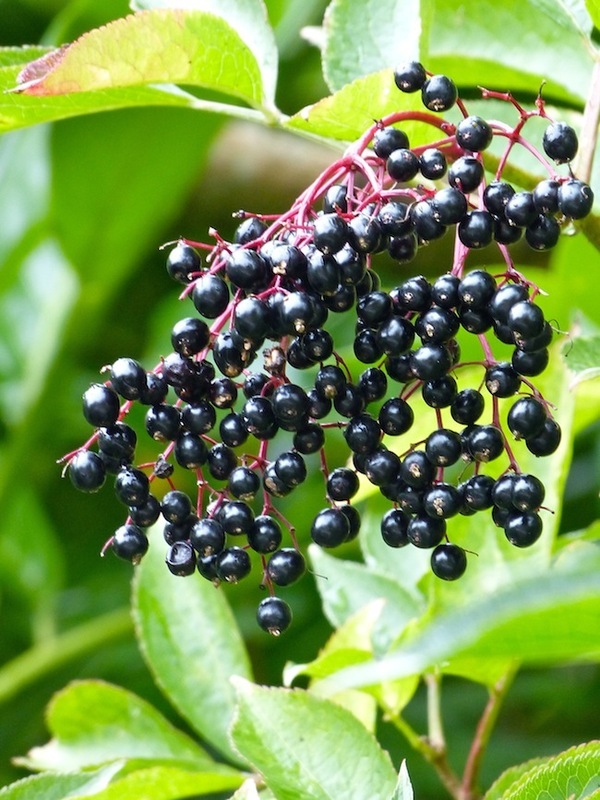 I was looking at elderberries while walking today.I have distant memories of the delicious syrup taste.My mum or gran used to make it and ive thought about it for years.Thank you for the recipe.Im ready to embark. Have just made some on a whim, it is absolutely delicious! Will be making lots more tomorrow, thank you for the recipe. Just made this for the first time…but I’ve been making elderberry compote from a recipe handed down through generations of women in my family… I’m from Austria and the compote made with elderberry is very well known and eaten everywhere. It’s called ‘Hollerkoch’ and is usually elderberries, plums, pears, cloves and cinnamon boiled up with sugar and water. Every family seems to have their own version of this recipe. At any rate…it’s delicious on top of Greek yoghurt! I am now enjoying my cordial as well…thank you! Just made up some elderberry cordial for the first time after picking them and freezing the 2 weeks ago. It is so freshly made it is still warm in the bottle! Chose the traditional recipe largely but did add a few squirts of lemon juice. Will do the tasting later! Looking forward to it. Thanks for the very easy recipe. And I managed to keep the mess to a minimum! I made this recipe in September after collecting a bagful of elderberries I happened upon near to where I live. I have a new awareness now if what bounty there are grieving around us! And cannot now wait for the elderflowers to arrive next year! Thanks for the great recipe which is delicious hot, cold or topped up with prosecco as a christmas tipple! Sorry about the spelling mistakes – the iPad has terrible predictive text……! Mmm, love the sound of the prosecco, Lainey! Will have to try that. Bare root elderberry bushes for planting arrived just yesterday for us. And although snow still covers much of everything here, grateful to discover this recipe in anticipation of future harvests … This is simple, intuitive and perfect! I like your site. Thanks! Sounds wonderful. I’met looking forwArd to making plenty for the residents and staffordable where my wife is now a resident. I hope your wife and the other residents enjoy the elderberry cordial, Paul – and that you do too. Hi this recipe sounds simple and just what I need. I missed to use the elder flowers so will try this instead. I don’t have a muslin cloth is it ok to use a plastic sieve? Hi Rosie, it’s fine to use a plastic sieve, but be aware that your resulting liquid will contain pulp, making it a coulis rather than a cordial. It would be delicious on ice cream or with yoghurt and cereal, or over other desserts. You could still dilute it with water to drink, but you would need to give it a good stir. Just harvested my elderberries to make another brew! Finished last years brew mid-summer but found a bottle made in 2015 in my garage … it was still perfect! Love it hot or cold especially with Fever Tree Tonic! I assume one could make other berry cordials this way, like blackberries and blackcurrants? 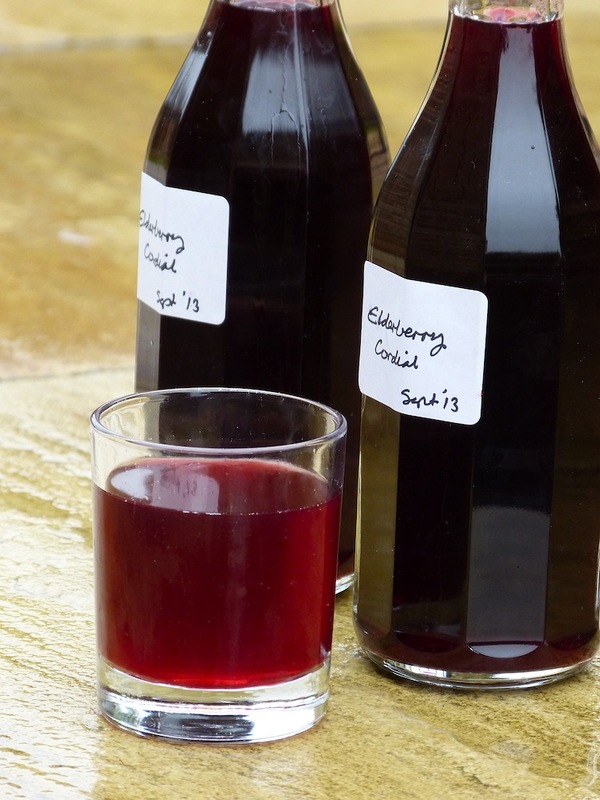 It’s lovely to hear how your elderberry cordial stays perfect over years. As long as the bottles are clean and airtight, these cordials can keep very well. And yes, please do use any autumn berries. I certainly throw blackberries and other fruit in. You may be interested in my plum cordial recipe https://wp.me/puhJU-24g which is one variant. Thank you I am going to try this today as I have a huge elder tree in ny garden and the berries normally get trodden thro the house! I have just made cordial but feel it’s lacking compared with elderflower to which I add tartaric acid .With cinnamon and mixed spice is it too late to add that lift of a sharper taste.Tried it diluted with soda but totally uninteresting.Diet lemonade was better tasting. What does one do with this labour of love? Apologies not to have replied sooner Rosslind. I think the cinnamon and mixed spice ideally have to be added at the heating stage, to infuse through the cordial, and then be strained out. Simply adding a slice of lemon or orange would zest it up a little. However, if you found the diet lemonade a better tasting addition, it could be that your cordial is not sweet enough for your taste? In which case, you might want to try stirring a little honey or even maple syrup into your glassful, and then adding a citrus slice too. Alternatively, you could reheat your cordial, adding your spices and citrus slices, almost like a mulled drink.